Doss, a devout member of the Seventh-Day Adventist Church and a conscientious objector, entered service as a medic for the 77th Infantry Division. Although he refused to drill or train on Saturday, Doss had no reservations about caring for his fellows’ medical needs on his Sabbath. His commanding officer tried to initiate a Section-8 discharge for Doss, but the lanky medic refused, saying “I’d be a very poor Christian if I accepted a discharge implying that I was mentally ‘off’ because of my religion.” In all other ways, Doss was an exemplary soldier who worked extra hours during the week to make up for his Saturday Sabbath — except once. After a month of continued fighting, the tide turned against the Americans on May 5. Almost immediately, at least 75 men fell wounded, and their comrades fell back and retreated to the base of Maeda Escarpment. Left at the top were the Japanese, the wounded — and Doss. Ignoring bursts of shells and artillery fire, Doss tended his injured comrades and began to lower wounded ad more heresoldiers carefully from ropes to the base of the escarpment. Japanese would advance while Doss lowered yet another man, and the wounded men would shoot the advancing enemy so that Doss could continue his work. 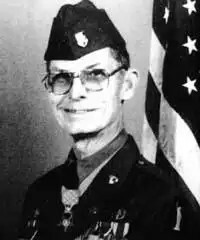 No one knows exactly how many men Desmond Doss saved that day. On his Medal of Honor citation, he is credited with saving 75 lives. Not bad for a day’s work — and May 5, 1945 was a Saturday, Doss’s Sabbath day.